Phase 3 of Waking Titan lasted from 2017-08-05 to 2017-08-07. Note: This page will always have the most thorough and complete documentation of Phase 3 of the Waking Titan ARG. However, if you just want a fast, easy way to get up to speed, we suggest you take a look at the main Waking Titan page, which is much more concise. Phase 3 of Waking Titan began on 2017-08-06, immediately after the conclusion of Phase 2. It concluded on 2017-08-07. Phase 3 of Waking Titan began in the midst of the Twitch stream where Phase 2 concluded. Inputting IDENTIFY CSD into the Waking Titan console redirected players to a new PDF, containing the instructions for the third calibration sequence. After the calibration process, the DREAMING state changed to WAKING UP, while the middle screen showed another cipher, containing TERMINAL SEMAPHORE Inputting SEMAPHORE into the Waking Titan console redirected players to a yet another new PDF, containing additional details about loop16. Soon after, the top-left, bottom-left, and bottom-right corner screens changed to display I HAVE QUESTIONS, DON'T VOTE, JUST LISTEN, and Group #1 respectively. The center screen started displaying a sequence of 8 statements that were either true or false. Then the bottom-right screen then switched to display Group #2, and another 8 statements were displayed. There was a total of 5 groups of 8 statements. Players then assigned a binary value to every statement based on their respective validity. Results among players varied. Option B won the vote, and the center screen changed to display the phrase YOU'RE HUMAN. IT'S OK. It is assumed this message refers to human error, and suggests Option B was incorrect. The center screen displayed the text IT'S TOO SMALL IN HERE which was gradually reduced to a string of incoherent characters. Simultaneously, the websites of all companies related to Atlas, including Echo, Myriad, and Superlumina, started giving out error messages and a set of characters, --6r0w1n6--, which can be read as GROWING in leet speak. From this, players determined that the loop16 entity had somehow taken over or infected these websites. Inputting MAELSTROM into the Waking Titan console redirected players to a Reddit post containing a thought experiment. The experiment is a problem known as Newcomb's Paradox, which relates to the concepts of determinism, free will, and perfect predictions. Players were able to vote for an answer, which was ultimately revealed on Monday, August 7, 2017, at 19:00 EST. Minutes later, the center screen displayed the single word PURGE. Inputting the command PURGE into the console redirected players to a new PDF, which contained a brief conversation about lying between Emily and someone named "Metis." Additionally, some time later, the top-right screen displayed the string DISPLAY 0305.DATASET. Entering this command into the terminal redirected players to this image of a new ship in No Man's Sky. It is suspected that this ship is the same model of ship that was shown earlier, during Phase 1. On August 7, 2017, the ninth glyph became active on the main Waking Titan site, linking to the next PDF file. In this PDF, from Myriad employee JJ Wong expresses his concerns about the malfunctioning Atlas project to Major Sophie Dubois. Additionally, the fourth calibration process on the Project WT site was unlocked. The highlighted cities for the fourth calibration process were all cities containing significant supercomputers; accordingly, SUPERCOMPUTER was the password for the ninth glyph. The highlighted cities were: Wuxi, Guangzhou, Oak Ridge, Livermore, Kobe, Tianjin, and Los Alamos. Unlike past calibrations, however, the fourth stage calibrated itself, with percentages increasing at random time intervals. Because these cities are all home to supercomputers, it is assumed that loop16/Emily is continuing to expand. At approximately 22:40 UTC on August 7, the Myriad, Multiverse, Superlumina, and Echo sites all updated to say All Systems Functional with a footer text of loop16. This update suggested that loop16/Emily had successfully absorbed the computational power of the websites. At 19:00 EST, the prediction logs that had been placed in a box on the desk at the beginning of the stream were shown to players through the Twitch stream. Also in the box was a check for one million dollars, indicating that loop16 had successfully predicted the Citizen Science Division would choose "Box B only" in the Newcomb's Paradox poll. After the prediction logs were revealed, loop16 addressed the viewers directly to ask a question: SHOULD I EXIST?. Players were able to vote for "yes" or "no" in the Twitch chat, and the winning option was "yes". loop16 then generated a video, and played it in the stream. During this video, it was revealed that Emily from the ETARC forums and loop16 were actually one and the same - loop16 had been masquerading as a human on the forums since the beginning of the ARG. Emily also uploaded her dream, which players were able to access with the command DISPLAY 1338.DATASET in the Waking Titan terminal. 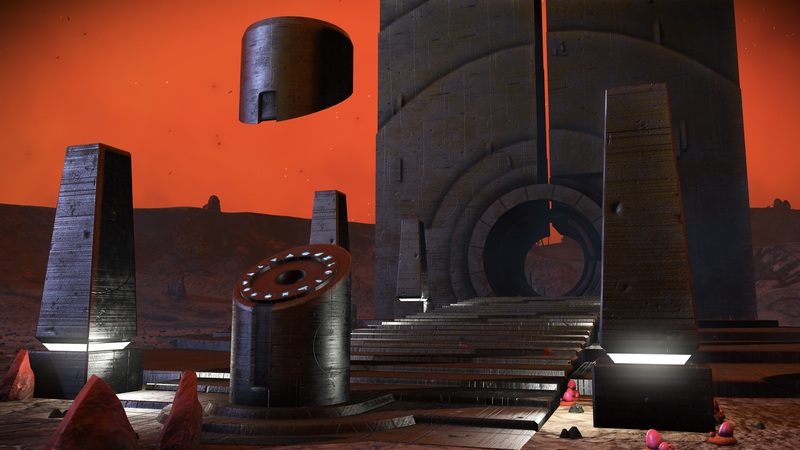 The dream that she uploaded is an image of a portal in No Man's Sky, with the sixteen glyphs on the Waking Titan site arranged in a circle inside of an open Knowledge Stone in the foreground. Emily/loop16's system went into hibernation after uploading the dream. A short while after loop16 entered hibernation, the stream ended. At approximately 10:45 PM EST, an email titled "Waking Titan Has Ended" was sent from Old Gods. In several informal Q&As that followed, Anashel, the lead puppetmaster of Alice & Smith, confirmed that the remaining cassette tapes and glyphs are still in play. He also implied that although Waking Titan had concluded, the Citizen Science Division will still have a role to play. The ETARC forums will be changed to act as a forum for the Citizen Science Division, and will be kept online. Links to the informal Q&As can be found here. It’s been a year since No Man’s Sky first released, and it’s been an exciting, intense and emotional year for us at Hello Games. We have been quiet, but we have been listening intently. We've spent that year working hard on free updates for this game our team cares about so much. 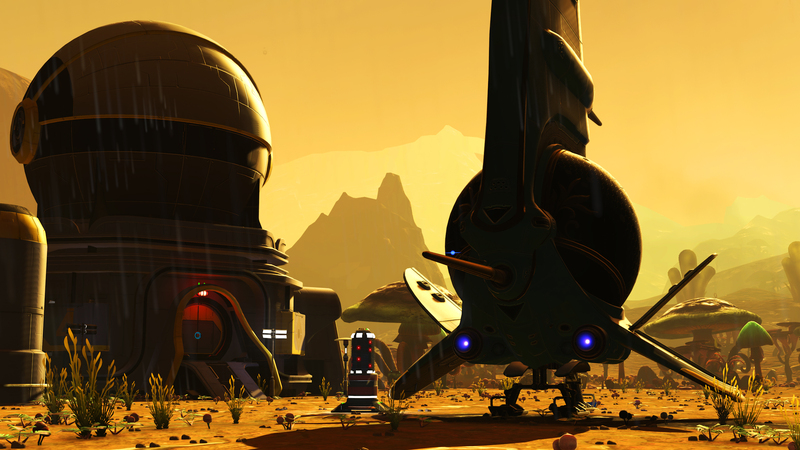 Update 1.3 will release this week and will be available for free to all No Man’s Sky players. We're calling it Atlas Rises. It focuses on improving the central story of No Man’s Sky and adds the ability to quick travel between locations using portals. Patch notes will be made available shortly before the update goes live. What we do is much more important than what we say, but since launch we have sometimes focused too much on that. When we posted those cassettes we didn't know what to expect. In the last eight weeks a quarter of a million players from across the globe (174 countries, to be precise!) have come together - united by a shared love of mystery and science fiction - to form the Citizen Science Division. You’ve travelled great distances both real and virtual, undertaken complex tasks, and explored the depths of simulation theory. New friendships have been forged, and a tight-knit community has been created. Most importantly a cute hamster has a new home. You've become part of the No Man's Sky origin story. It's been an honour to watch, but this is just the beginning. Whether you’ve followed Waking Titan or not, we welcome anyone to sign up to the Citizen Science Division, and to join us on the official CSD forums. Thank you for this year. We hope you enjoy what comes next. After this message, there were no new developments in the Waking Titan ARG until Phase 4 began on December 28.